How will Brexit effect food supplies? With the uncertainty of Brexit looming over Britain, many people are stockpiling food supplies to prepare their families for a potential emergency. Given 60.4% of all UK imports currently come from the EU, it’s not too hard to see the problems that could be lying ahead. When it comes to Brexit, the potential food trade agreement that could be reached between the UK and the EU is still uncertain, however if an agreement cannot be negotiated, we’re likely to see a huge rise at the supermarket till. In May, the University of Sussex released data that suggested households could each pay approximately £500 more every year, with dairy products, fruit, vegetables and meat being restricted. On the dinner table, pork sausages will be one of the foods set to suffer, as price of beef and pork could rise by between five and 29%, according to the BRC. 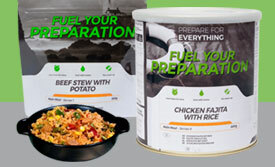 If you’re worried about the potential food shortage, here are some simple steps you can take to prepare in advance. Whilst you don’t want to blow your budget, you may want to consider adding an extra couple of items to your weekly shopping list in the coming weeks. Items to buy in advance include British-produced flour, oats, sugar, salt, vinegar, mustard and lentils. Alongside this, you’ll want a stash of your high-quality EU goods. It’s good to start with the basics including items such as olive oil, pepper, pasta and rice. For flavour, you’ll want spices, chilli and herbs, anchovies and tomato paste. For strength you’ll need protein. Cheap and easy to store, canned and dried pulses (kidney beans, butter beans, black beans, chickpeas) and tinned fish are good items to buy before Brexit. Fruit and veg will be one of the main food groups impacted by Brexit, and there are fears that the ‘Brexit Diet’ will leave Brits malnourished. If this is a concern, why not grow your own? Pick up a packet of seeds and create a vegetable patch in your garden. Tomatoes, lettuces, potatoes and radishes are easy to grow, requiring minimal effort on your part. If you’re worried that you might not be able to pop down to the local supermarket and pick up whatever you fancy for dinner, planning your meals in advance will ease your mind. One pot dishes such as stews, soups, and pastas are cost-effective and long-lasting. It’s a good idea to get into the habit of creating a weekly meal plan for your family and freezing them throughout the week. There a thousands of recipes online, and reassuring your family they’ll be having a tasty dinner in the evening will keep any anxieties at bay. How can we help you prepare for Brexit? At Fuel Your Preparation, we understand how it feels to be worried about the future, and want to help you prepare for any potential emergency that lies ahead. To help you beat Brexit, we offer a wide variety of meals and kits that are high in nutritional value, easy to order online, and can last for up to 25 years on the shelf. With a wide range of meals and ingredients to choose from, we’re sure to provide you with exactly what you need to see through winter more comfortably. We’ll also deliver your order to your door within 3-5 working days. 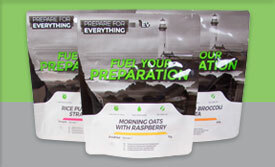 From sweet morning oats to tasty chicken tikka masala, our tins and pouches will see you through breakfast to dinner. 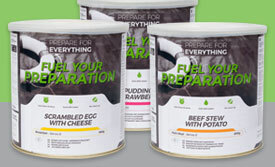 Take a look at our meals and kits to see what we’re serving up.